The Governments and the State of Qatar have signed five Memoranda of Understanding (MoU) for the establishment of partnerships between the two countries. 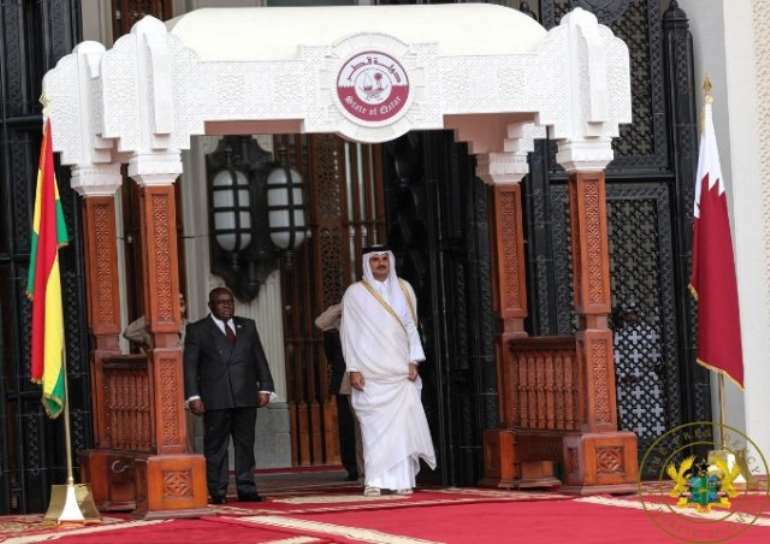 This signing ceremony took place on Tuesday, when the President of the Republic, Nana Addo Dankwa Akufo-Addo, paid a day’s official visit to Qatar, where he held bilateral talks with the Emir, Sheikh Tamim bin Hamad Al Thani. The first MoU signed was the “Agreement on for the avoidance of Double Taxation and the prevention of Fiscal Evasion with respect to taxes on income”. This agreement would help to alleviate territorial double taxation of the same income by the two countries. The agreement was signed by the Foreign Affairs minister, Shirley Ayorkor Botchway, and, on behalf of Qatar, by Ali Shareef Alamadi, Minister for Finance. The next MoU was on “The Regulation of Manpower Employment in the State of Qatar”, signed, on behalf of the country, by Mr. Ayorkor Botchway, and, on behalf of Qatar, by Uposif Bin Mohammed Al Othman, Minister for Administrative Development and Labour and Social Affairs. These were both signed, on behalf of Ghana, by the Minister for Foreign Affairs, Hon. Shirley Ayorkor Botchway, and, on behalf of Qatar, by Sultan Bin Saad Al Muraikhi, Foreign Affairs minister. The “Memorandum of Understanding between Qatar Chamber and Ghana National Chamber of Commerce and Industry” was the last to be signed. This was done by Nana Dr. Appiagyei Dankwoso I, President of the Ghana National Chamber of Commerce and Industry, and Shaikh Khalifa Bin Jassim Bin Mohammed Al Thani, Chairman of the Qatar Chamber. President Akufo-Addo and Sheikh Tamim bin Hamad Al Thani also pledged to deepen the ties of co-operation and bonds of friendship that exist between the two countries for the mutual benefit of their peoples.